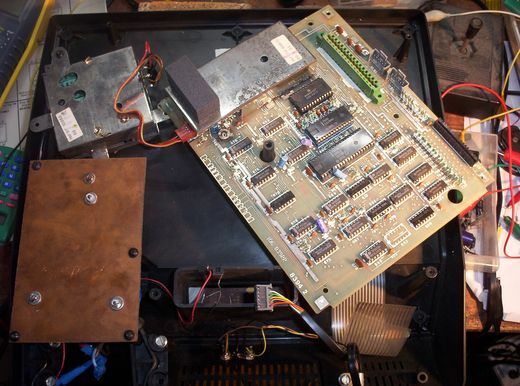 Verify that the main board looks similar to the one pictured above. Video is generated by IC652, the Intel 8245 video processor. Video output is digital RGB: Red, Green, Blue, and Luma (intensity). These signals go the IC679, an unnamed PAL video encoder IC. A composite video signal is output on pin 5, goes through variable resistor R748 and proceeds to the RF modulator. See Video G7000 Schematics for more information. The composite video signal can be picked off pin 5 of if IC679 but it is unsuitable for driving a standard 75 ohm TV/monitor as is. The signal is only about half a volt in size so requires some amplification. The audio signal can be taken straight from pin 27 of IC652 but it is quite large and could do with some attenuation (unless you like it loud!). 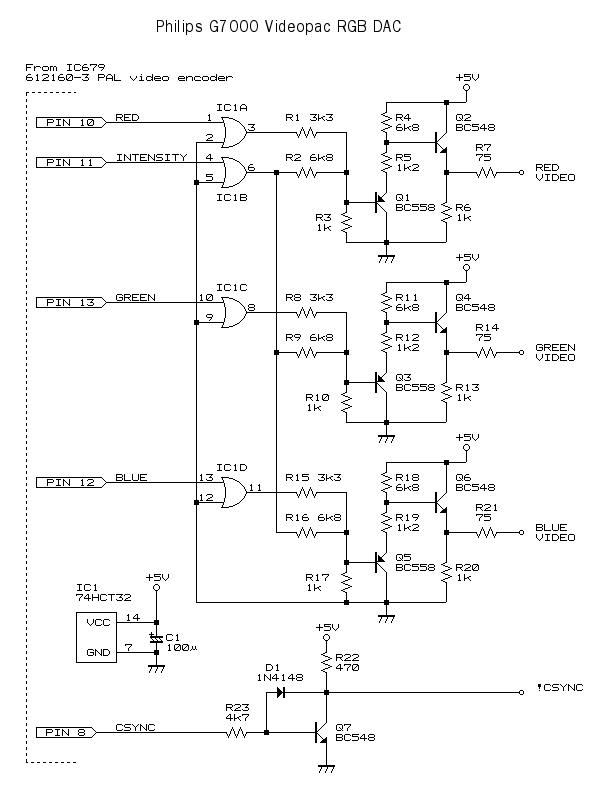 Here is a circuit for a suitable video amplifier. Operation: Video is coupled via C1 and clamped (sync tip clamp) to a refrence voltage provided by R1 and R2. Voltage amplification is done by Q1/Q2 and associated resistors. Q3 is required to drive a low impedance monitor. For those who want an even better quality video signal, it is possible to used the RGB video provided by the 8245. It can't be used directly in it's digital form (unless you own a CGA monitor) so a DAC circuit is required. 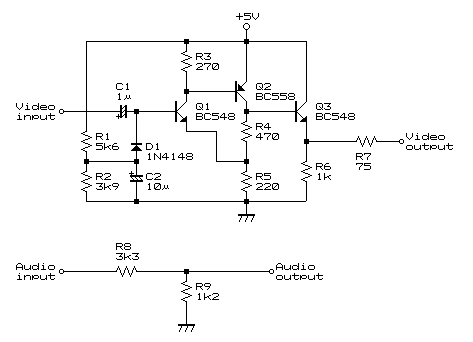 IC1 acts as a buffer, it doesn't need to be an OR gate but it DOES need to be 74HCT series logic. The use of 1% tolerance resistors is recommended but not essential. The signals are all suitable for an RGB SCART connection (even the !CSYNC, though the composite video mentioned above would be better).